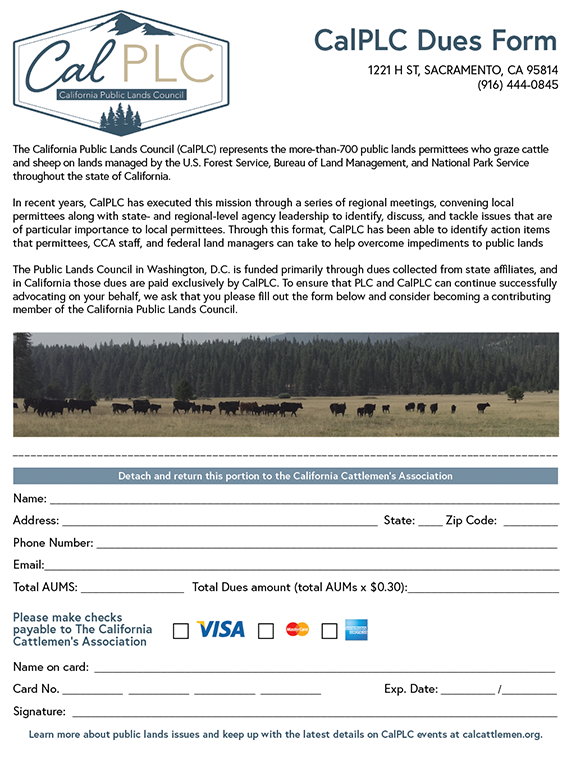 The California Public Lands Council (CalPLC) represents the more-than-700 public lands permittees who graze cattle and sheep on lands managed by the U.S. Forest Service, Bureau of Land Management, and National Park Service throughout the state of California. CalPLC seeks to further CCA’s Federal Lands policies through targeted outreach to federal land managers and public lands permittees within the state of California. In recent years, CalPLC has executed this mission through a series of regional meetings, convening local permittees along with state- and regional-level agency leadership to identify, discuss, and tackle issues that are of particular importance to local permittees. Through this format, CalPLC has been able to identify action items that permittees, CCA staff, and federal land managers can take to help overcome impediments to public lands grazing. CalPLC serves as the state affiliate representing California within the Public Lands Council (PLC), the preeminent lobbying voice on behalf of public lands grazing permittees throughout the west, headquartered in Washington, D.C. PLC has been extremely successful in pushing a legislative agenda benefiting public lands grazing permittees. PLC is funded primarily through dues collected from state affiliates, and in California those dues are paid exclusively by CalPLC. To ensure that PLC and CalPLC can continue successfully advocating on your behalf, we ask that you consider downloading a CalPLC dues form and become a contributing member of the California Public Lands Council. Click here or on the adjacent form to download a CalPLC membership form. Since 1968, the Public Lands Council (PLC) has actively represented the cattle and sheep producers who hold public lands grazing permits. The PLC advocates for these western ranchers who preserve our nation’s natural resources while providing vital food and fiber to the nation and the world.